Before “WRECKAGE” there always comes “HAVOC”. 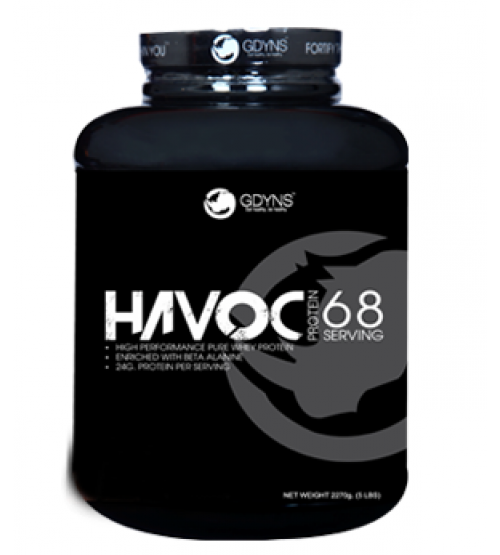 “HAVOC” is an intermidiate level supplement suitable for both amateurs and professionals. “HAVOC” is prepared under the surveillance of a professional team to check the quality of protein. Their main aim is to deliver a premium quality of protein powder certified by “GMP” and “FSSAI” faculties, all the ingredients and final products are tested carefully. This supplement powder is made from whey protein ( Instant) which is derived from pasteurized whey using multi-purification process. All the non-protein and water elements are removed from whey Concentrate and that’s why it is considered as the purest form of whey. “HAVOC” is the trademark of GDYNS Healthcare Pvt. Ltd. Caution: This product is to be consumed as a food supplement. Under no circumstances should you choose. to consume this product for medicinal purposes.